This sequence shot is extracted from the movie "Des spectres hantent l’Europe". An extract of that shot launches the movie but the sequence unfolds itself in some other way. Its isolation, steadiness and duration render the full tension of time and commit our gaze to Maria Kourkouta’s one. The tension of our look progressively turns into an attention to the people passing before us, because the gaze sometime reverses. March 2016. The European Commission closes the « Balkan route ». 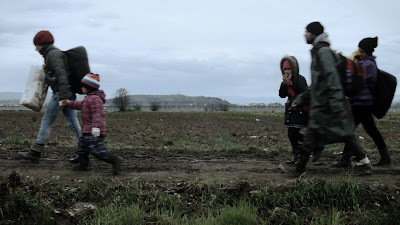 Nevertheless, in the afternoon of Monday March 14th, several hundreds of the 15 000 refugees stuck at Idomeni manage to bypass the barbed wire barrier erected by Macedonia, by going through the fields. Afterwards arrested by the macedonian army, refugees are sent back in the greek territory. Despite that failure, this collective action remains an ultimate emancipation gesture and an statement for freedom of movement in a self walled up Europe.